In light of the upcoming National Mosquito Control Awareness Week (June 21 – 27), Mr. Mister Mosquito Control, one of the top rated mosquito control companies in the country, is urging families to be aware as we near the height of another busy mosquito season. Recent reports have officials preparing for the threats of West Nile and Chikungunya for the 2015 season. Mosquito season starts in March and lasts through October, making this preparation timely for the imminent arrival of breeding mosquitoes. · A plant based bug spray such as Bite Blocker Organic Xtreme. · Stock any ornamental ponds with guppies, koi, or goldfish (most healthy, hungry fish will eliminate the majority of mosquito larvae from ponds). · Eliminate decaying foliage from ground. · Use fans in living areas that are without a natural breeze or air movement. Mr. Mister is highly invested in giving back to local communities and across the globe. With new customers, they donate life-saving mosquito nets through Nothing But Nets to help combat the epidemic of malaria and other mosquito-borne illnesses. Mr. Mister readily donates to Adopt a Golden Atlanta by funding heartworm medication for orphaned Golden Retrievers, as Heartworm Disease in dogs is exclusively caused and transmitted by mosquitoes. 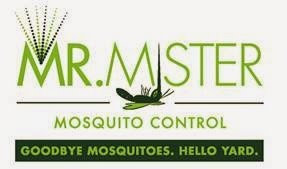 Also protecting our littlest ones from the threats of mosquitoes, Mr. Mister regularly provides pro bono treatments at community schools and parks, including: Atlanta’s Weinstein Preschool, Morningside Elementary, Globe Charter School, Dunwoody’s Brook Run Dog Park, and Little Nancy Creek Park in Buckhead. Mr. Mister Mosquito Control offers ClearZone Misting treatments and Automated Misting Systems for complete protection and control. As a resource, www.mrmr.biz outlines mosquito solutions to fit families‘ outdoor lifestyles.